H.E. Minister Pech highlighting ambitious future activities of Public Administrative Reform in fields such as public services, gender, e-government, human resource management, training of civil servants and pay reform. Phnom Penh – Teachers conducting exams without asking for extra money, health stations opening for full days providing adequate services, ID cards being issued at no additional charge within a reasonable period of time – such are behaviours of the civil service desired by citizens and the vision of the Royal Government of Cambodia. In January 2015, the National Program for Public Administrative Reform (NPAR) 2015-2018 was officially approved by the Council of Ministers. This came as a big milestone after the Royal Government of Cambodia had established the Ministry of Civil Service in late 2013 for the purpose of overseeing and reforming all matters related to the public service and its workforce. Having co-operated with the Ministry of Civil Service and its predecessor for five years through its “Decentralisation and Administrative Reform Programme” implemented by GIZ, Germany happily supported the drafting process of the new reform programme and its dissemination to all ministries and sub-national institutions. On the 1st of April, some 500 civil servants from across the country and the capital gathered at the InterContinental Hotel in Phnom Penh. After welcoming remarks by H.E. Youk Bunna, Secretary of State at the Ministry of Civil Service, Ms Birgit Strube, First Secretary of the German Embassy, lauded the responsible authorities in the name of the development partners for their elaborate and ambitious outline of the reform. In her speech, she also mentioned a recent study on government openness with Cambodia ranking almost at the bottom (http://data.worldjusticeproject.org/opengov/#/groups/KHM), mainly due to the absence of effective feedback and complaint mechanisms for citizens. H.E. 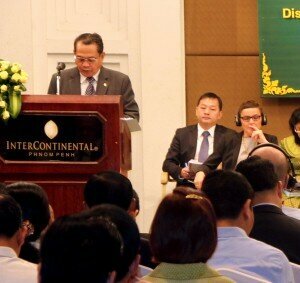 Minister Pech Bunthin, then, reiterated the urgency of the reform and the significance the government ascribes to it. H.E. Kong Sophy, Director General for the Department of Civil Service Policy, presented the key pillars of the reform in depth. The fields of improving public service delivery, professionalising human resource management and development as well engaging in pay and remuneration reform were vividly communicated to the participants. At the same time he emphasised the supportive role of the Ministry of Civil Service and stimulated all institutions to kick-start their own reform processes. He also acknowledged the alarmingly low ranking of Cambodia in the above-mentioned study, and reaffirmed the political will of the government to address the root causes of these findings. In the afternoon, sector ministries such as the Ministry of Health and the Ministry of Education, Youth and Sports highlighted ongoing reforms within their institutions. The workshop also provided a valuable opportunity for participants to directly ask questions to the Ministry of Civil Service. Concerns about the pace of reform, questions regarding its implementation, matters of integrity and complaints about bureaucratic burdens were raised and with great patience addressed by H.E. Youk Bunna. Eventually, H.E. Minister Pech Bunthin concluded the dissemination workshop highlighting ambitious future activities in fields such as gender, e-government, monitoring and evaluation, training of civil servants and pay reform. He also expressed his gratitude toward the German government and GIZ for their continued support and stated a strong interest in future Cambodian-German co-operation in public administrative reform.